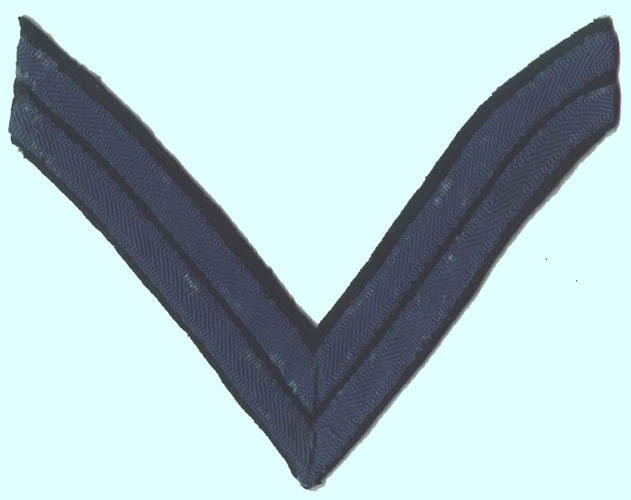 The grade insignia of an infantry corporal was two light blue stripes sewn on a dark blue wool background. Light blue is the infantry branch color. The material of the stripe is a strip of woven worsted cloth tape that has been folded over at the point of the chevron. This creates a slightly different pattern to the weave on each arm of the chevron. The organization of a Civil War period company called for eight corporals to be chosen by the company's captain and confirmed by the colonel. When promoted a corporal would be paid fourteen dollars a month, which was one additional dollar greater than privates. The origin of the word corporal is believe to be from Latin corpus referring to his authority over a body (corpus) of men. The chevron is an ancient heraldic insignia. In heraldry a chevron was symbolic of a roof. It indicated someone who was either a protector or someone who had built or accomplished something. It was first identified with non-commissioned officers in the late 18th Century when it was adopted by the French army and later the British. The earliest mention as a noncommissioned officer insignia in United States Army regulations was in 1821.